Raymond “Ray” Lyle Nauman, 86, of Coles Valley, died Friday, January 25, 2019 at the Morrow Memorial Home, Sparta, surrounded by his family. He was born at home in Norwalk on April 10, 1932 to Ervin R. and Lucy L. (Van Dyke) Nauman. On August 13, 1951 Ray was united in marriage to the former Virginia Anderson at the little brown church in Nashua, IA. Ray was 19 and Virginia was 17 and they told their parents that they were going to church, which they did, but came back hitched! And so it started their love for each other, their family, and their land. He loved taking part in his children and grandchildren’s activities and cheering them on a job well done. Ray loved his farm; it meant the world to him. He worked many jobs to make his dream come true including work on the interstate when they were constructing it. Ray also did custom chopping filling many area farmers’ silos, and hauling fire wood to keep people warm from Tomah to La Crosse. Ray loved his Holstein dairy cattle and built a fine herd of cattle winning many awards. He passed his love for farming on to his children and grandchildren. 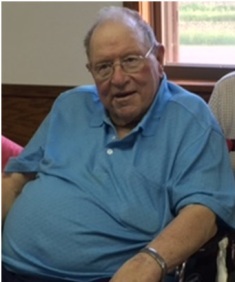 He was a member of St. John’s Evangelical Lutheran Church in Ridgeville, Monroe County DHIA, Monroe County Holstein Association, and the National Dairy Shrine. Ray was a kind and caring person who was a very hard worker. He started the love of the land with his family. Ray is survived by four children, Kathy (Ronn) Braatz; Merry (Jerome) Kuderer; Laurie (Tom) Graber; and Penny (Bill) Chambers;; grandchildren, Dawn (Troy) Sommers; Christopher Kuderer; Justin Kuderer; Jason Kuderer; Bob (Autumn) Graber; Brian Graber; Brandon (Leigh) Graber; Phillip and Connor Chambers; Danielle, Jeremy, and Nicolette Nauman . He is further survived by his great grandchildren, Alexa, Lauren, Jackson Sommers; Sanoe, Brett , and Shawn Graber; and Austin Nauman; siblings, Virginia Heasty, Betty Jeanne Pottinger, Karen Stark, and Virgil Nauman; a daughter-in-law, Margie Nauman; and many cousins, nieces and nephews. He was preceded in death by his loving wife, Virginia Nauman; a son, Jerry Nauman; sisters, Vivian Nauman and Irene Gilbert; brothers-in-law, Clifford Heasty, Frank Gilbert, Kenneth Pottinger, and Louis Stark; and nephews, Craig Stark and Tom Gilbert. A memorial service will be held at 7 p.m. on Thursday, January 31, 2019 at the Lanham-Schanhofer Funeral Home, Sparta, with Pastor Robert Gerke officiating. Visitation for Ray will be on Thursday from 4 p.m. until the time of services. Interment will be held at a later date in Mound Prairie Cemetery, Coles Valley. Online condolences may be offered to Ray’s family at www.schanhoferfh.com. The family would like to extend a sincere thank you to the entire staff at the Morrow Home for the outstanding care given to Ray during his time there. In lieu of flowers memorials can be given to St. John’s Evangelical Lutheran Church, Ridgeville and/or the Morrow Memorial Home, Sparta in Ray’s name.